Cape Town - Katlego Mphela believes that he will add more value to the Kaizer Chiefs team as he continues to get back to full fitness. The former Mamelodi Sundowns striker has struggled for game-time at Chiefs, having spent a considerable time sidelined through injury. But he has been back in the picture in recent weeks and has started in the Glamour Boys’ last two matches. Mphela, capped 53 times by Bafana Bafana, is thrilled to be making a contribution for the Soweto giants, and hopes to become an integral part of the side as the season moves towards its climax in May. 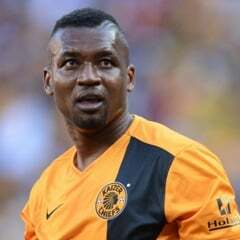 Mphela told the club's official website: "I am improving with each match. I also feel getting stronger and stronger physically. I try to help the team play good football. “As the number nine I have to link up with the midfield and help create chances for my team-mates. The way I play now has taken away some of the pressure on Bernard Parker.